Few flowers leave a stronger lasting impression or create a better focal point than lilies. Large, lush and available in a variety of colors and sizes, these blooms are the stars of hand-held bouquets, vase arrangements and centerpieces no matter what the occasion. Highly prized and heavenly scented, these flower shop stunners add proportion and pizzazz, but are often priced a bit higher than other typical hothouse stems. Here are a few tips for getting your money’s worth. While the large, open blooms of a lily are more likely to draw your attention, try to stay away from the stems with flowers that are completely open. Instead, look for buds that are just starting to open up inside your florist’s cooler. A few hours out at room temperature will have these blooms starting to unveil themselves and they will stay fresher and last longer than petals that are already out and about. The best ones to choose will have just a few petals peeking out to reveal the stamen and pistil. Get rid of them! 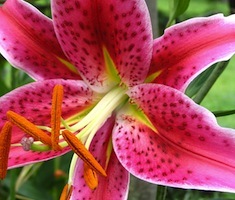 Lilies have very large, ahem, reproductive parts and produce a lot of dark, orange pollen on the ends of their anthers. While this grainy characteristic makes them fertile and fruitful, the pollen will often stain the inside of the petals and blemish the bloom of the lily. Using a tissue or paper towel, gently turn the stem upside down and pluck the pollen-making parts off the inside of the flower. The pollen will stain fingers and tabletops and is surprisingly hard to get out of clothing, but come right off quite easily. This simple task is a great way to keep white lilies white and an excellent way to protect tablecloths from the sometimes over exuberant fecundity of lilies. Always look for lily stems with as many blooms as possible and pay attention to which of those flowers are open. Lilies, like many other flowers, typically bloom from the bottom up. Rather than choose stems that have the most open flowers at the moment, pick ones that have one or two bottom flowers open with several closed buds towards to top. Many times florists will put lilies on the discounted aisle if the bottom buds have bloomed and gone, but as long as there are a few at the top of the stem that have started to open, you’ll have another week or two to appreciate these flowers that are definitely worth the price.